…for Compost2theMoon to remind you about some simple ideas to help make the holidays greener! Get a real tree. Ideally, one grown locally as opposed to say… shipped to a Home Depot near you. Not only will your home smell like lovely pine without any artificial sprays or candles, but you are contributing to a business that is good for the planet. I know, I know: Instinct dictates that cutting down trees = bad. But that isn’t exactly the case in the business of Christmas trees because higher demand = more trees planted. Christmas tree farms are a big business. We’re talking about 56 million trees bought each year that grew and absorbed carbon dioxide for 5-16 years before getting tied to the roof of your car. Read all about it a previous post, “Purchase the Pine, People.” (By golly gosh, those are some cute sisters in that picture!) Of course, purchasing the tree – roots and all – to be replanted after the holidays is the absolute greenest of the green but not everyone has the land for that. Re-use ribbons, gift bags, paper, baskets, jars and everything else from last year. If you didn’t hang on to them, be sure to do so this year! Simply pack them away with holiday decorations and you’ll be amazed at how little you have to purchase next year. Make your own gift tags from last years holiday cards. This is our FAVORITE tradition. If you don’t think you’ll have time to make them on your own, feel free to donate them for next year’s re-purposing promotion. Email me for details and mailing address. Buy local! Supporting local artisans, small business, farmers, grocers and organizations is a great way to keep wealth in the community and reduce the footprint of large manufacturers and shipping. For great gift ideas in our region, check out Foodshed Magazine’s 2012 Holiday Gift Guide. Give food! Yummy holiday treats rarely go to waste. Consider purchasing gifts that give back through organizations like the World Wildlife Fund. Not only will you be donating to an important cause, you’ll get on the mailing lists for similar organizations that send out holiday-themed return address labels and wrapping paper made from recycled materials (and a request for a small donation). As far as online shopping, Amazon is one of our favorites because of their eco-friendly, frustration-free packaging. If you can’t find what you are looking for on there, be sure and sign up for an account on your favorite sites so that you can save items in your cart until all your purchasing is complete and can be sent in a single shipment. Save yourself the shipping fees and save the packing materials and shipping miles. Brighten your home and tree with LED lights and be sure to put them on a timer. If you aren’t fond of the bright-white, grab a colorful strand instead. If you’ve got any tips for the season, please tell us about them in the comment section. Maryland Dining Services Commits to 20% Sustainable Food by 2020! Big news out of the University of Maryland today! Compost2theMoon’s very own Allison Lilly has been working hard to improve the sustainability of the food system within Dining Services and it is paying off in a big way! The department has created and launched a Sustainable Food Working Group, comprised of students, faculty and staff, which will collaborate to create a more sustainable and healthy campus. They will also be launching a Far-to-School series of planned activities including special dinners in dining halls, sponsored workshops, on-campus visits with local farmers, and off-campus farm tours. “Dining Services’ goals for sustainable food are well aligned with the University’s strategic plan and the President’s Climate Commitment. The Sustainable Food Working Group is a wonderful example of innovative cross-campus collaboration,” says Wallace D. Loh, University of Maryland president. In addition to all this awesomeness, the gang at Dining Services will continue its participation in four on-campus vegetable gardens and the Farmers Market at Maryland. Click here to learn more about UMD’s Dining Services Sustainable Food Commitment. Author DeborahPosted on October 25, 2012 January 23, 2013 Categories Organic MattersTags food, food miles, green living, Just Saying, local, sustainabilityLeave a comment on Maryland Dining Services Commits to 20% Sustainable Food by 2020! Not exactly. Although the pollinating butterflies these cuties become are very welcome at organic production farms, their larva stage is better nurtured in say… a nearby demonstration garden or conservancy. Lucky for me, I just landed a gig working in a new Loudon County, VA community, Willowsford, built around conservation, sustainable cultivation, real food, really cool farmers, and a really great garden. 10.) The masterminds behind this community are incredibly down-to-earth, determined, and committed to conservation as much as they are committed to the growth of the farm (in terms of acreage, value-added products, biodiversity, and profitability). 9.) The bees and their keeper are going to be producing local honey and educate the community on the importance of pollinators. 8.) The garden is bonkers amazing and already includes: tons of berry bushes, herbs, fruit trees, tomatoes, flowers, and gated entrances as adorable as the open-air structure slated for a classroom/market/shed. 6.) Not only is there deer fencing around the farm – it is around the garden too! 5.) There are tons of Mexican sunflowers, zinnias, and other butterfly-attracting plants in rows between tomatoes, peppers and other edibles which makes times spent harvesting extra beautiful. 4.) Pretty much all-you-can-eat fresh and healthy “seconds” all day long. 3.) Everyone I have met is keen on bringing our beloved Eco-Goats out to help clear weeds! 2.) Fellow Farmers: Nick, Jen and Kathryn and Farm Manager Mike Snow are pure sunshine – even in the hardest, back-breaking moments, and have gone far out of their way to teach me tricks of the trade, welcome me to the team, and accept the fact that they may have to kill my share of tomato horn worms. 1.) Husk Tomatoes. Sometimes called “Ground Tomatoes” because you harvest them from the ground once they have fallen off of the plant. If you have not yet tried one, step away from the computer and head to the closest farmers market. Severna Park Earth Day on Saturday: http://severnapark.patch.com/articles/9th-annual-earth-day-expo-at-spms#pdf-9379365 Where the Eco-Goats will be! 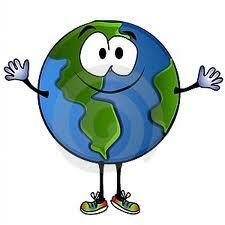 If you aren’t local, check out the Earth Day Network for information about events near you! Author DeborahPosted on April 20, 2012 June 19, 2012 Categories Organic MattersTags buy local baltimore, conservation, earth day, environmental, flowers, health, local, treehugger, treesLeave a comment on Happy Earth Day! 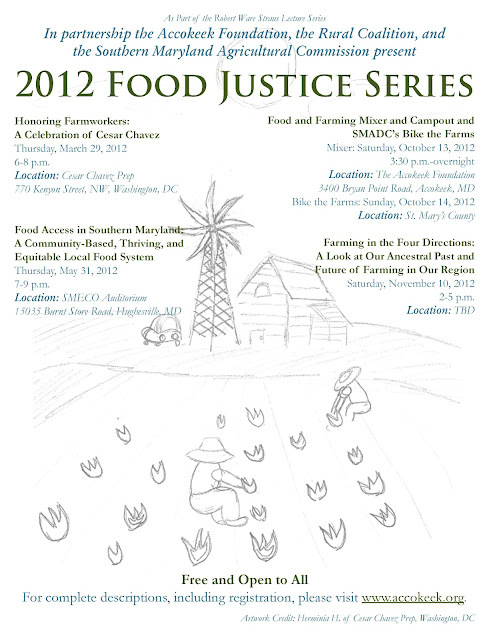 The Accokeek Foundation, Rural Coalition, and Southern Maryland Agricultural Development Commission co-present the 2012 Food Justice Series. The Series kicks off this Thursday, March 29th, at 6:00pm at Cesar Chavez Prep with “Honoring Farmworkers: A Celebration of Cesar Chavez,” which includes a brief film screening and discussion with members of the Chavez Family. This four-part presentation of the Robert Ware Straus Lecture Series brings together farmers, policy advocates, community leaders, faith- and government-based initiatives focusing on building local, equitable and sustainable food systems. Topics include a celebration of the legacy of Cesar Chavez, farmworker justice, food access in Southern Maryland, and young and beginning farmers as well as a look at our diverse ancestral farming in this region. Study participants who ate ice cream the week before the study were less excited about eating ice cream during the study. Researchers associated this with increased cravings yet less derived pleasure associated with repeated drug use. The more ice cream you eat, the more ice cream you need to get an ice cream buzz. It is unlikely that a person would develop a “full-blown addiction” to ice cream but the addictive properties could lead to overeating and weight gain. While it was my initial intent to poke fun at this study, I have to admit that I not only crave ice cream – I succumb to those cravings very often. Why? Because I love everything about ice cream! Who doesn’t?! I’ve never come across someone eating ice cream who isn’t happy. I don’t drink or smoke, I exercise regularly, I eat more vegetables than my garden can grow, but the hard-to-put-in-writing truth is that I have been known to consider a bowl of ice cream a great way to start my day. However, in response to this study I have decided to give up ice cream for the remainder of the month of March in hopes to determine whether or not I am addicted. I will tweet cravings/confessions as I have them and report back on the topic come April. In the meantime, there will be a lot more pistachio ice cream available for students on the University or Maryland, College Park campus. Author DeborahPosted on March 7, 2012 June 19, 2012 Categories Organic MattersTags addiction, ice cream, local, moderation, sugar1 Comment on Is Ice Cream Addictive? For more information and to register for the conference, visit the Brookside Gardens: Green Matters website.